Virgin Media Dublin International Film Festival preview: Irish Filmmaker Ian Fitzgibbon (Perrier's Bounty, Moone Boy) writes for Culture about his new film, inspired by Kevin Barry's short story collection Dark Lies the Island, which premieres at this year's Festival. I have long been an admirer of Kevin Barry’s writing. He has such a unique voice, what really struck me was what a powerful sense of place he has. The rural world he describes seems to be in terminal decline, everybody is f**king everybody else, but what struck me most powerfully was the humour its pitch black -my kind of humour. I had been doing a lot of UK and US TV work, I was looking for something of my own to do something more personal I suppose. I was introduced to Kevin’s short stories by Tommy Tiernan, I was blown away by them and I was particularly drawn to Breakfast Wine. I got in touch with Kevin straight away. I thought it would make a perfect short so I brought it to Michael Garland and we got financing from the Film Board. To watch your film with an audience is always a nervous experience, but it’s also fascinating to see what they respond to, what they connect with. It did well on the festival circuit, won a few prizes and that’s when Kevin and I started talking about a feature. So for a couple of years between other projects Kevin and I developed the script wherever we were, we’d have these long Skype sessions. I think we went through six or seven drafts before we felt we had a film. Getting a film off the ground can be a frustrating process, with many ups and downs, but I think we both had faith in it and Michael Garland was always confident we could get it financed. One of the things about working abroad as much as I do is that you lose touch with what’s going on at home. 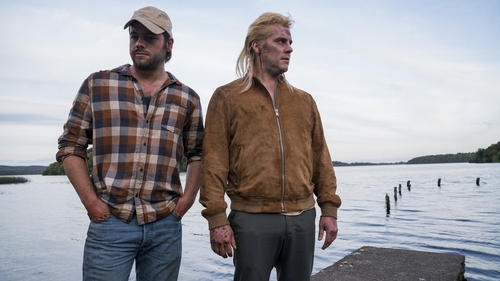 It was so exciting for me to meet all these new Irish actors - Peter Coonan, Moe Dunford and Charlie Murphy. What a revelation, they were so great to work with it. To work at home was such a delight, our crews really stand up to the very best, Cathal Watters is such a fine DOP I’m very proud of the world we created. To watch your film with an audience is always a nervous experience, but it’s also fascinating to see what they respond to, what they connect with. We had a preview last year; it was a packed cinema, and Kevin and I sat at the very back. It was so wonderful to hear the gasps and the laughs, I cannot wait for the Virgin Media Dublin International Film Festival screening. Dark Lies The Island will be screened at Cineworld on Feb 27th - tor tickets and more info about this year's Virgin Media Dublin International Film Festival programme, go here.